It likely comes as no surprise for those of you who have been following my recent reads that I've fallen in love with historical fiction - again. It happens a few times a year. I discover a historical novel I fall head-over-heels for and feel compelled to run out and read everything I possibly can within the genre before I become bored of it. In this case, it started with Kate Forsyth's The Wild Girl and seemed to swiftly end there as well since Forsyth's other historical fantasy title was miles away, across the ocean, sold seemingly everywhere but the United States. As a result, I stumbled across Susanna Kearsley; yet another author not sold within the United States but whose novels were slowly being re-published - with gorgeous covers, mind you - and this time available for American audiences. After reading glowing review after glowing review and receiving one too many recommendations to pick up The Winter Sea, I finally relented and requested a copy at my local library. 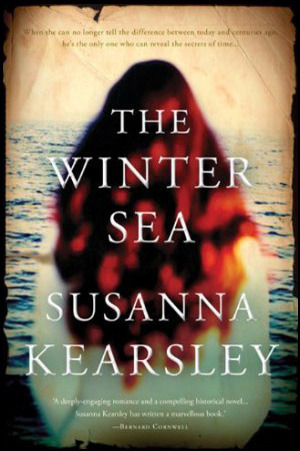 The Winter Sea is a difficult tale to describe, but Kearsley's prose will have readers enamored from the first page itself. Following a young author, Carrie, as she embarks into depths of Scotland seeking inspiration for her latest novel, The Winter Sea is part fiction, part history, and part some other genre entirely. 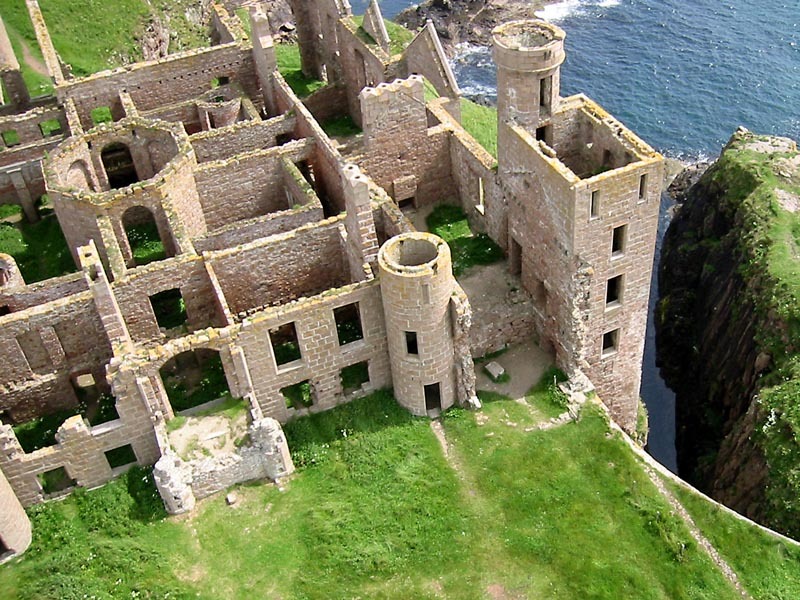 When Carrie stumbles across the ruins of Slains Castle, she feels oddly drawn towards the location and rents a nearby cottage, finally having found the spark to write which eluded her for so long. Now, approaching her novel from a different angle, Carrie begins to draft her novel from the perspective of a woman, one who she names after a distant relative, Sophie, who, too, was alive during the Jacobite Revolution Carrie plans to write of. But as Carrie dreams of Sophie's life, attributing her sudden knowledge of the time period to the vast research she performed prior to drafting her novel, she is eventually forced to admit that details of Sophie's life - an existence she believes is fictional - may, in fact, be real. Kearsley's prose is stunning, not so much because of her words or their placement in a sentence, but rather because of the lush atmosphere she builds. I finished this book blinking in surprise at being in my rather dusty old home in New Jersey instead of the windy cliffs of Slains, Scotland. While I struggled at first to connect with Sophia's perspective, I absolutely loved the strong love stories and detailed historical research that went into The Winter Sea. Eventually, I was thoroughly wrapped up in these dual narratives; Carrie's in our present-day world as she struggled to find answers to the odd situation she found herself in while simultaneously striking up a tentative romantic relationship with a history professor and Sophie's as she resided at the Slains Castle during a dangerous time period and found her own love in the most unexpected of places. Although The Winter Sea is a love story, it is, first and foremost, a tale of two fiercely independent women. Sophie, in particular, is forced to sacrifice much for her love due to her place in the era she lives in, but her courage and bravery is palpable on every page. In contrast, Carrie never undergoes the difficult journey that Sophie faces, partly because modern-day Scotland is a far safer place than it was centuries ago, but her spirit is no less indomitable. What I love, especially, is the fact that both Sophie and Carrie find men who are willing to fight for them and accept them for the women they are; men who treat them well and make them happy. The Winter Sea is a slow, languid story, but one I felt compelled to keep reading, if only to hang on and witness the fate of these two women whose lives had become so closely intertwined with my own. This review is gorgeous Keertana, I love how you're able to have phases where you fall into certain genres completely. I can see why this book would leave such a great impression with you, I think I will have to give Kearsley's prose a chance soon! Kate's books are avail. at The Book Depo (both the US and UK websites), hun! Grab yourself Bitter Greens, stat! And this sounds wonderful, I love hist. fic, too, so I am adding it to my to-read right now! I do love when you fall for a genre all over again. And, OMG. A book that can set me in the wilds of Scotland and make me *feel* like I'm there? Yes, please. First, I want to move to Scotland. Immediately. Look how gorgeous! Second, I'm like you Keertana. Once I find a book I like, I tend to go on a bit of a binge of that particular author or genre until I'm finally desperate for something else. I'm in that place right now with fantasy. Can't get enough of it. Glad this was a winner of a historical novel for you!!! I won this book several years ago and it has languished on my shelf since then. Then I thought maybe my mom would like it so I gave it to her telling her not to give it away. I sure hope she still has it. I gotta read it now! And I'm with Jenny, I want to move to Scotland!! Keertana, I bought this and several of her other books Christmas of 2012 when B&N had a huge eBook sale..and epic fail..I have not read it yet. This sounds like my kind of book, and your review has reminded me to get to it! I can't wait to read this book myself. I've had it for quite some time!! Your review just reminded me that it was chosen for book club, or rather a suggestion,but we never read it. I really enjoy my historical fiction as well, especially well done. I have not read this one, but boy do I want to.